An interdisciplinary team from the University of Delaware was one of six finalists from universities across America selected to compete in the Capital One Modeling Competition held in the financial corporation’s headquarters in McLean, Va.
Pictured are (from left) Titus Awokuse, Zhiqi Zhang, Ruizhi Xie, Yue Tan, Yan Hu and Du Zhang. The final six teams were chosen from a field of 33 universities and, in addition to UD, included Ohio State University, Virginia Polytechnic Institute and State University, which fielded two teams, Texas A&M University and Southern Methodist University. 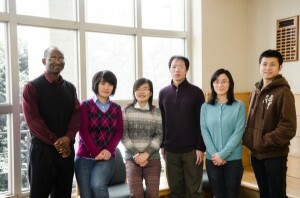 The five-member UD team consisted of graduate students from three different colleges — Ruizhi Xie, a doctoral student in the Alfred Lerner College of Business and Economics who is also a master’s degree student in statistics in the College of Agriculture and Natural Resources (CANR) and received a master’s degree in agricultural and resource economics from CANR; Zhiqi Zhang, a master’s degree student in CANR; Yue Tan and Yan Hu, both doctoral students in the Lerner College; and Du Zhang, a doctoral student in the Lerner College and a master’s degree student in the College of Engineering. The competition required the team to use creativity and statistical problem solving skills to develop an analytic tool to uncover insights about individuals’ spending patterns. The goal was to predict how those individuals would spend at certain merchants and to develop a strategy for those merchants to assign discounts to customers who use their Capital One cards at their places of business. Xie explained that the group was given a large amount of real transactional data of customers from 3,000 different merchants. The data included information such as the merchant ID, the date of the transaction, the amount and whether the purchase was made on-line or in the store. From that data, Xie said the team “basically applied the optimization strategy and the modeling strategy to predict the likelihood of the future expenditures for every customer of certain merchants.” Zhang said that she enjoyed how Capital One allowed the team to use real data to solve the problem for the competition. “Most of the time, the data from the bank is confidential. They don’t want to provide the data to personnel outside the company but because we were solving a real problem for them, they provided us with the real data.” Xie said that the group worked on the project for about two months and once they made it to the finals, they spent two sleepless nights preparing for the project’s final presentation to the bank executives. Zhang said the interdisciplinary aspect of the team helped them greatly as the members could each tackle individual problems on their own and also within the group during meetings, which were held twice a week. “It was very efficient working in this team. Before the meeting, everyone prepared his or her own part for the meeting and during the meeting we could exchange ideas,” Zhang said. “When we talked about our ideas, sometimes we could find that something might be wrong and the other people could give us feedback, and that was great.” Tan said he had two favorite parts of the competition — the teamwork aspect and the fact that they got to use the real world data. “I enjoyed dealing with the real banking data. If you go into the industry, this is the kind of data you will experience every day. And the other thing was we had very good team work and I enjoyed that part, too.” The team was introduced to the competition and advised by Titus Awokuse, chair of the Department of Applied Economics and Statistics (APEC). Zhang said that working with Awokuse was beneficial because he has “a real direct connection to the industry field so we could get this opportunity. The manager of this project sent the invitation directly to him so we could take part in this competition.” Xie, who has been advised by Awokuse since 2009, said he has helped her with studies and research, especially “how to identify research problems and how to tackle them using different methodologies to try and reach the conclusions. I’m very grateful to him.” Awokuse said he thought this opportunity was a fantastic one for the students. “I think overall it was a very good experience for our students because not only did they work with data based on a complex real world problem that has potential to help a real company, they also got to interact with people in the industry.” Awokuse continued, saying that the people at Capital One were very impressed with the students’ presentation. “They liked the models that the students developed. Their models were the best in terms of accuracy of prediction and I was very impressed with them. They did excellent work.” Article by Adam Thomas Photo by Danielle Quigley This article can also be viewed on UDaily.